Home / _Movies / star-wars-last-jedi / StarWars / The Geek Twins Discuss: "Star Wars: The Last Jedi"
The Geek Twins Discuss: "Star Wars: The Last Jedi"
Summary: In the second installment of the new trilogy, Star Wars: The Last Jedi picks up right where Star Wars: The Force Awakens ended. 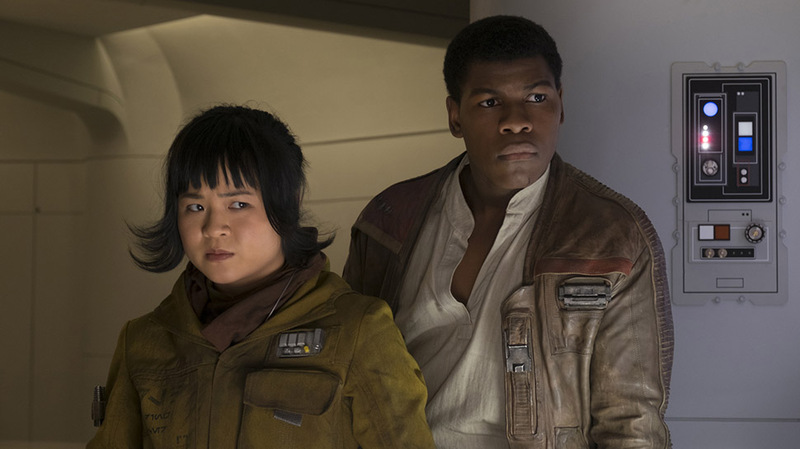 As Rey tries to convince a reluctant Luke Skywalker to train her and lead the Resistance, Finn and his new ally Rose Tico try to save the survivors of the First Order from annihilation. WARNING: This discussion will contain spoilers of Star Wars: The Last Jedi. Nigel: You know, I don't know if it's because I'm getting older or because I'm African-American or because I just think differently or I'm crazy, but lately, I've been feeling more and more disconnected from the geek community at large. First, it was when I found out geeks were complaining about Spider-Man as a black teenager. More recently, it was things like people saying The Orville is better than Star Trek: Discovery. Now there's the outcry over Star Wars: The Last Jedi. I honestly don't understand why any Star Wars fan wouldn't like the movie. I thought it was awesome. How say you? Maurice: Yeah I liked it a lot. I was really confused that fans didn't like it. A lot of people complained the last movie was too similar to the first ones. Now people complain the movie is too different. It did an amazing job reconstructing the first movie. Little things like when Snoke told Kylo to take off "that ridiculous mask." Because when you think about it, it is kind of silly. Vader has it to breathe but Kylo just wore it to look cool. Nigel: I also liked the line where Snoke berated him for being beaten by a girl who'd never held a lightsaber before. It did address the issues from the last movie. I guess we need to get the negative stuff out of the way. I've intentionally been avoiding a lot of the backlash, but it seems like people are upset about things that didn't fit their expectations. That's why I thought it was so incredible. It was the first Star Wars movie since Empire Strikes Back that actually surprised us. I think that's a pretty big deal, especially compared to the prequels where you knew what the ending would be before the credits rolled on Episode One. I can understand people's concern for the way it broke the hero's journey and tropes. At the same time, it's not like everyone died in the first five minutes or Rey went to the Dark Side and took over the Galaxy. The Force Awakens introduced shades of gray in the black-and-white morality of the original movies by making a stormtrooper a hero, and the villain drawn to the light side of the Force. Maurice: The first complaint I was aware of is Luke Skywalker. Even Mark Hamill felt the character was very different from the previous films. It was surprising but not in a bad way. For example, people say there's no way Luke would try and kill Kylo. Those people are forgetting that he almost killed the Emperor. The only reason he didn't cut off his head with a lightsaber is Darth Vader blocked him. Luke doesn't have a problem with killing those on the dark side. Look how many stormtroopers he killed. What did you think? Is it out of character? Nigel: Not at all. As you pointed out, Luke was ready to kill the Emperor. Also having seen the chaos the Emperor and Darth Vader caused, it would be tempting to end it early. It was like that old paradox of whether you would kill Hitler before he became Fuhrer. I would like to take a more high-level view of the movie. I thought it was tough to make an original movie and Last Jedi nailed it. 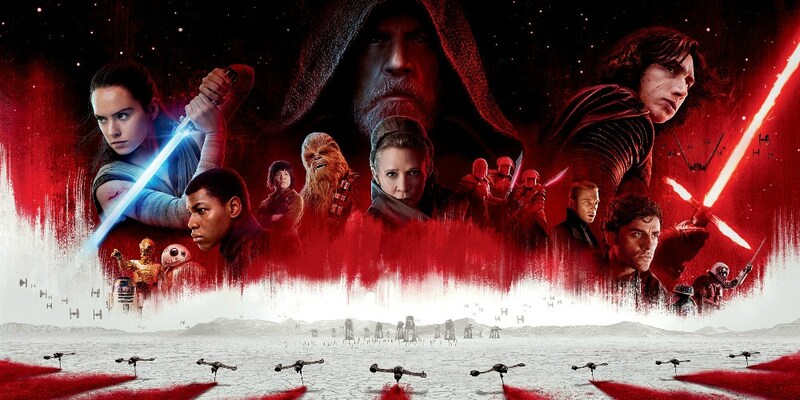 The image of the Resistance being on the verge of being wiped out was gripping, the opposite of the first trilogy where the Rebellion was gaining on the Empire. Seeing ship after ship being destroyed had me on the edge of my seat. It also gives the series somewhere to go with the Resistance having to rebuild itself from nothing. Maurice: It definitely managed to outdo the original films in tension. Seeing the main ship struggling to outpace the dreadnought while losing ship after ship. Seeing Leia fly out of the ship and realize the First Order has wiped out command. Even the realization that Starkiller Base has done what the Death Star couldn’t do: wipe out every planet the resistance used in one blow. All of that gave a level of fear that the movies had never had. Nigel: Let's talk about Leia's near-death escape for a moment. I'm not usually someone who gets upset over the death of fictional characters. When people complain about a character dying in a movie, TV show, or book, I usually find it baffling. Even the death of Han Solo didn't really shock me in Force Awakens. That said, when Leia went flying out of the spaceship, I gasped out loud and grabbed my seat and felt a pang of loss I've never felt in a movie before. Maybe it's the knowledge that Carrie Fisher died in real life that made it more real, but that was heartbreaking. And then she opened her eyes and used her powers to pull herself back into the spaceship. Considering, this was the only time we'll ever see her use the Force, it felt completely bogus and unrealistic. So the Force lets her survive in deep space, pull herself into a moving spaceship? Sure, that can happen. But it was a cheap shot to make her think she was dead, and it means we never get to see the movies address her actual death. To me, that was the perfect way for her character to die, especially with the brief moment when we saw Kylo Ren hesitate to kill her and then watch the other fighters destroy her and his reaction. Maurice: I admit i got choked up on that. That would have been a good way to end it but I’m glad it didn’t end that way. Having Kylo kill both parents would have felt too familiar. Make her exit from the movies surprising. Her force reveal was powerful and it makes sense that she didn’t tap into it until it was life and death. "After all, she never had training," Johnson said in an interview. "I liked the idea that it’s not Luke concentrating, reaching for the lightsaber; it’s an instinctual survival thing, like when you hear stories of a parent whose toddler is caught under a car and they get superhuman strength, or a drowning person clawing their way to the surface. It’s basically just her not being done with the fight yet." Nigel: I can understand the reasoning. I was just a little disappointed by the fake-out. As for the other side of the story, Rey's journey with Luke was absolutely not what we were expecting, but I thought it was a great way to keep from repeating the Yoda sequence from the original trilogy. When Luke held the lightsaber, stared at Rey, and just dropped it and walked away, that made me laugh. I was expecting him to say "who are you" or something but no. It made sense to me, after the disaster of his attempt to train Ben Solo that he would turn away. His comments about the Jedi also made sense considering the prequel showed how the Jedi had failed. I never liked that about the prequels, how the Jedi seemed like a bunch of bickering politicians. Now The Last Jedi took that to its furthest reality. I thought the idea of Luke abandoning the Force and trying to teach Rey to leave it behind made sense, and also added tension of "will she become a Jedi or not." Maurice: This movie had the biggest surprises of any other Star wars movie. Its interesting that the most common complaint of The Force Awakens was that it felt too familiar. Now people are complaining that it's too different. My biggest complaint is that it looks like Finn and Rey aren't going to be a couple. They never had much chemistry but I was really looking forward to the two getting together. Now all the shippers are fawning over the love story between Kylo and Rey. Not me. If I wanted Darth Vader to have a girlfriend I'd read fan fic. It's not a perfect movie by any means. Some of the character motivations were a little confusing. The action lagged in a few places. The biggest complaint I have is I have no idea what's going to happen next. But that might be the greatest compliment. Nigel: I agree with your comment about big surprises. Were there any real surprises in the prequel trilogy? Things like Padme turning out to be the queen or Darth Sidious as Senator Palpatine were two of the most telegraphed moments in the history of cinema. It seems like people wanted the familiar and were most upset by the idea of the movies shattering their expectations. But that's what was needed, to throw us all off and set us up for the unexpected. There were some weak moments, of course. Like you said, some of the ways the characters behaved didn't seem to make sense, but I'm fine with that. Real people behave in ways you don't expect like laughing when you find out someone is dead or crying when you see your first child. I'd rather have surprises than a story that follows the dots. I thought some of the set-pieces were amazing, like the casino planet. I felt like Star Wars was falling into a rut in terms of alien planets with just variations of "single-environment" worlds like the desert planet Jakku. The casino world was the first time we'd really seen wealthy people in the Star Wars universe, other than Jabba the Hutt. It was a nice change in tone. Then there's the major new character, Rose Tico. I thought she was wonderful, a character who had a small role in the Resistance and elevated to saving the Galaxy. I also cheered when she kissed Finn. I admit, I wanted to see Rey and Finn in the first movie, but they honestly didn't have too much romantic chemistry. I can see Rose more, and seeing a major Asian character is long overdue. Maurice: Yeah the focus from planets to cities has more longevity. The view of the wealthy and the theme of oppression was carried nicely. The First Order dominated the galaxy but the people on Canto Bight were dominated by the 1%. Rose is awesome. Lots of personality and an original one too. She’s not the typical hero and has a real arc. Starting as a real nobody and ending saving Finns life. Nigel: I also want to talk about how the basic elements of Star Wars were handled, the fights. I thought the space battles and lightsaber fights were better handled in The Last Jedi. The opening assault on the dreadnought was awesome, and seeing Kylo and Rey fight the guards was one of the best fights in the history of Star Wars. Maurice: Agreed. Although I have to say the Revenge of the Jedi opening space battle is the best in the series. The Praetorian Guard fight was amazing since it was against multiple opponents without lightsabers. No pointless backflips or spins either. People can argue about character motivations but no one can disagree with the action scenes. Nigel: All that being said, I would rate Star Wars: The Last Jedi five stars. Lots of action, lots of drama, and a unique story. Certainly a worthy successor to Star Wars: The Force Awakens. While it might not be the fun, popcorn flick I was expecting, it takes the series in new directions and stands up to all the original films. 5 stars.